The Hyrax appliance from Ortholab Zuid. 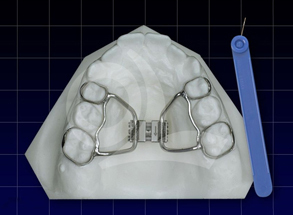 The hyrax appliance is an all-metal expansion device which is laser-welded onto 4 bands. By means of a special long key, the expansion screw can be unscrewed, so that a narrow upper jaw achieves the correct relationship with the lower jaw.